You recently became a Mom and are breastfeeding your infant. But, looking at yourself in the mirror you sadly remember your old figure. You set aside those dresses and jeans that you wore prior to giving birth. Have you gained weight? Could your current figure be better? All women who have had children, don’t be upset; it is not that difficult to lose weight if you know the proper methods. 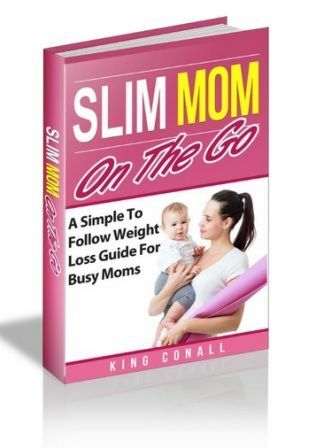 We recommend the book “Slim Mom On The Go” to all Moms! How does one lose weight? Many women think that they will leave the hospital postpartum and look like the movie stars that grace the television. Unfortunately, it is not so. The fact is, the body won’t go back to its original form. The skin needs time to tighten and the muscles of the stomach need to get used to the new fat cells that were collected during the pregnancy. On average, the process of weight loss for a nursing woman is about as long as it took for her to gain the weight – eight to nine months. In order to balance the new hormones in the body because of all the milk production, the process of weight loss will be slow, but steady. Lactating burn about 800 calories and if a woman doesn’t change her usual calorie intake (hoping she wasn’t overweight prior to the pregnancy) then her body will slowly burn off the extra weight. Her body will use the calories she intakes and everything else will be burned by lactating.